This is the question we get asked most frequently, and it’s also one of the hardest to answer because oil capacity depends on the specific make, model, and year of your equipment. Rather than try to list thousands of models, here’s how you can find the information on our most popular brands if you’ve lost your operator’s manual. One of the best resources for tractor information online is Tractordata.com. You can search hundreds of brands and thousands of models from new equipment to the real dinosaurs of the farm industry. Naturally, you want to substitute your brand and model number for the one I used. Change that, and leave everything else the same. You don’t always get the callout box. Here’s what it looks like when you search for a Kubota M6040. You can also search TractorData.com directly. Scroll down until you find your model, and then click on the model number to go to the product page. You can also use the tabs to search by Year, Power, Series, or Factory. Just under the tabs, you can switch to lawn or industrial tractors, if that’s what you’re looking for. 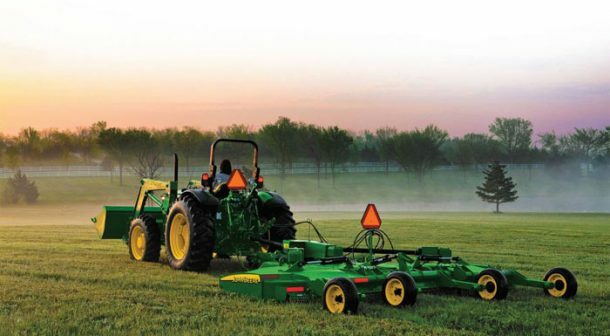 John Deere Quick Reference Guides page gives you capacity and a maintenance schedule. The guide will tell you when to change the oil (after how many hours of use), how much to use, everything you’ll need, and what the part numbers are. It’s free, and you can right-click and save it to your computer for future reference. You can also check the John Deere Filter Maintenance Information page. You’ll find a list of tractors by series. Just click on the one you need for a schematic of filters and capacity for all fluids. It’s free, and you can right-click and save it to your computer for future reference. If you’d like a complete manual, check the John Deere Technical Information Store – Manuals generally run $30 – $40, and you can order a book or download a digital copy. John Deere manufactures its own parts, including oil and filters, specifically designed for their brand. For John Deere lawn tractors, you can buy home maintenance kits that come complete with filters and oil. Kubota’s manuals are available for free download at Kubotabooks.com. You’ll just need to find the model number on the list. If you don’t find your tractor on the list, you can purchase a manual here. Find out when to change the oil on the Kubota lubricant maintenance page. I have a ts115 new holland boom axe. Just got a warning light and symbol indicating the hydraulic pressure is not charging correctly. Could this be due to filters needing to be changed or possibly a leak in the valve body? Any help would be appreciated.